Sport Touring Tire from Bridgestone designed to provide stability on highways while performing just like a sport tire on winding roads. In any road condition (WET or DRY) the tire provides steer precision and supports high cornering speed with extra stability. 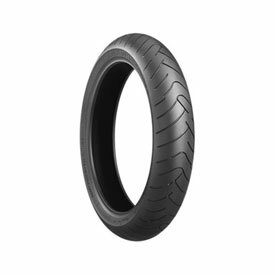 Full Spec Sport Touring Tire offering consistent performance between touring and sport riding. Tread pattern and rubber compound delivers long mileage, high level of wet performance, comfortable ride and good grip. Silica plus an RC polymer (assist silica effect and controls rubber properties) enhances wet performance and wear life. These Bridgestone tires work great, the BT23 is a good choice for a street bike, sticks and wears fairly well. I really like these tires a lot. Purchase the same every time! These tires grip extremely well and give long life. I run them on a ZX10r all in the canyons and provided me with excellent traction. Great tire so far. Feels nice on the turns and rides smooth. Very happy with the performance. Great service and fast delivery!! AWESOME tire....way better than the t30!!! !